If you are looking for more snack recipes then do check Shakarkandi Chaat, Bombay Veg Sandwich, Methi Na Gota, Rice Flour Chegodilu, Gujarati Gathiya, Indori Bhutte Ka Kees, Masala Pav, Ulundu Kozhukattai, Roasted Phool Makhana and Poha Vada. Take the flour and salt in a mixing bowl and mix well. Add ghee and combine well to get a breadcrumb like consistency. Make smooth and firm dough by adding water little by little. Cover the dough and set aside for 30 minutes. Add the cumin seeds and fennel seeds and fry till they begin to change color. Then add the green chillies and saute for a few seconds. Add the finely chopped onion and fry till light golden color. Add the coriander powder, cumin powder, salt, red chilli powder, amchur, turmeric and chickpea flour and fry for 2 – 3 minutes. Add coriander leaves and combine. Knead the dough and divide into 9 – 10 round balls. Roll out each portion of the dough into a 4 – 5 inches diameter circle with a rolling pin. Place a spoon of the onion stuffing in the middle of the disc. Wet the edges with little water. Bring all the edges together and seal it well. Flatten very gently into a 3 – 4 inches diameter circle. 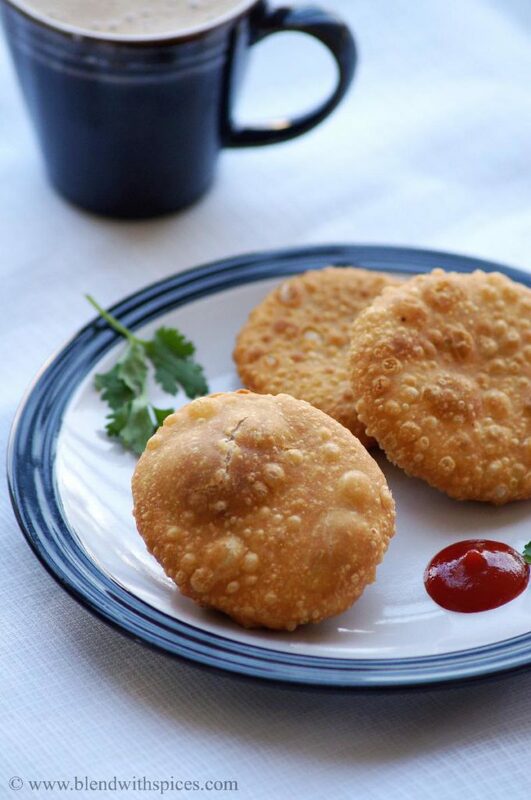 Continue making the rest of the kachoris and cover them with a damp cloth. Heat oil until hot and gently drop a couple of kachoris at a time. Reduce the flame to low. Turn over in between and fry till they become golden brown and crisp. The oil should not be very hot. It should be medium hot. Drain them paper towels and serve hot with coriander mint chutney or tomato sauce. Super crispy and definitely a very addictive kachoris.. The filling seems interesting. Didn't know one had to add chickpea flour. The kachoris look delicious ! one of the favorite kachoris and yum too.